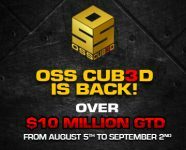 The OSS Cub3d is BACK From August 5th to Sept 2nd — $10 Million Guaranteed!! Our popular Online Super Series Cub3d tournament extravaganza returns to Black Chip Poker and Americas Cardroom in August. Prepare yourself for four-straight weeks of exciting online poker tournaments! Each individual series will have its own leaderboard. The winner of each will walk away with an $8,000 package to compete in any one of the remaining Live Cage Events this year in San Jose, Costa Rica. You can earn points based on overall finish, number of runners, and amount of buy-ins of each tournament. Make sure you reload your account before the series starts to take full advantage of the 50% OSS Cub3d Reload Bonus up to $200. Deposit using bonus code: MOSS between July 29th and August 3rd to qualify. Things kick off with the Mini Online Super Series. It’s designed to give small stakes players a chance to score big with prize pools that still pack a punch. This series will guarantee almost $1.1 million and culminate with a $88 buy-in $300k GTD Main Event on Sunday, August 12th at 4pm ET. Our flagship tournament series offers a mix of small, medium and large buy-ins to accommodate every type of player and guarantees over $4.6 million. The middle series will conclude with a $265 buy-in $1,000,000 GTD Main Event on Sunday, August 26th at 3pm ET. Last but certainly not least we have the Bigger Online Super Series. We are guaranteeing over $4.3 million and catering to high stakes players. The BOSS and entire OSS Cub3d series end with a bang. It ends with two $1,000,000 GTD tournaments ($540 and $2,100 buy-in) on Sunday, September 2nd! Deposit using over 60 different Cryptocurrencies at Americas Cardroom and Black Chip Poker!!! Previous: What Can We Expect from Johnny Manziel in Second Start?